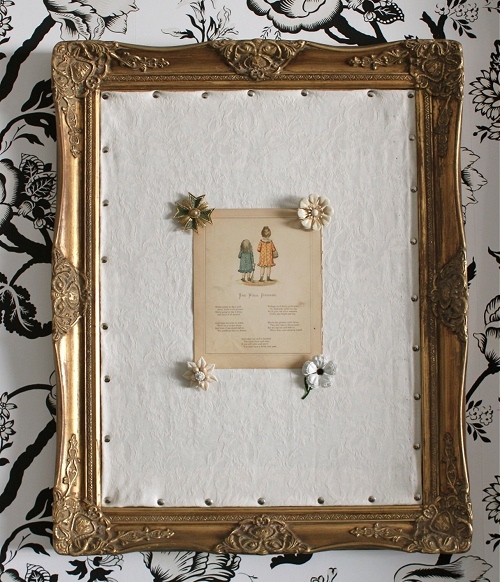 A while back I took a old bulletin board I had and put it in this vintage gold frame. Then when I had a show and I needed a display for my jewelry, I started looking around the house for what I could use. I thought a cork board would be perfect! Only problem was, you could really see the gold jewelry that was hanging on it, so I covered it in this cream fabric I took from an old tablecloth. After the show (several months ago), I just hung it back on the wall as is and it has been looking pretty plain ever since. Yesterday I decided to spruce it up while Ruby was in her seat eating a quick snack, so I only had about 5-10 minutes. I grabbed an old children's book I found on etsy awhile back, the binding was shot, but the pictures are sweet. I didn't want to use thumb tacks, I needed something more classy...hmmm...brooches! 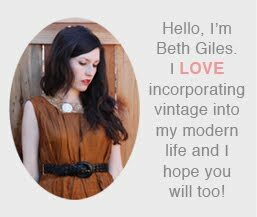 I seem to have an endless supply of vintage brooches, so I just stuck one in each corner and I was done. Love the pushpins! Great idea to show a little bling and vintage style! What a great idea! Love the sweet picture. I think I may do an adaptation for my office. Thanks.